.......53 Buddhas and Me .................My Life Adventures.....: "Doors"
I have always had a fascination with doors. I love looking at them, photographing them, wondering about all the characters that have passed thru them and what goes on b ehind them. Last week I came across Luize's blog and she had some great shots of some doors and so I thought I might share some of mine. These shots were taken in the tiny historic town of Chiltern. I was on my way back to Melbourne from Albury and decided to stop of to get some breakfast. 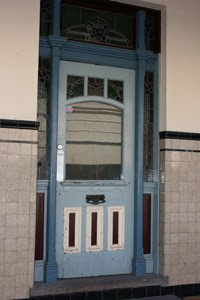 It was really early in the morning and the only shops open were the bakery and the newsagency, so I decided to wander the towns historic main street and get some door photos. 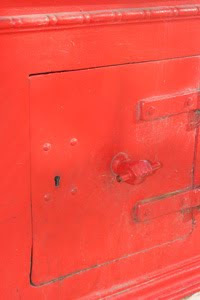 The photo of the "Little Red Door" is actually a tiny door on the main street post box. If you look closely the handle is a hand holding the rail. Is was s o cute - imagine all the mail that has passed this little hand. The "Blue Door" was the entrance to the local "Pub". Now if this door could talk imagine the stories it would tell. I bet there were a lot of people who remembered walking in but don't remember walking out or maybe even getting thrown out. Next time you are standing in front of a door, imagine all of the exciting stuff that door could tell you. You and doors and me and doors! I once painted a whole series of doors and windows - best selling artwork I've done. I have a fascination with them too! The more unusual the better! I even thought of writing a story about a door - and all the people who have walked through it. Oh I should only live long enough to write and/or paint all my ideas! Very nice pics! Thank you for sharing! Doors are fascinating, your photos are wonderful. I have found that I cannot allow myself to enjoy a door unless I know myself and what is behind my closed door. It is only then I am free to choose any door to explore, even if only in my imanination! And i thought i was the only one who takes pics of doors... I have pics of doors through Paris - they are my favourites, so full of history and colour and texture... and lots of great ones in England too.